Our 24 hour pet hospital is located in New Castle, Delaware, and serves the entire Delmarva region, including Wilmington, Newport, Stanton and Newark. Emergency: Call ahead to our 24 hour emergency vet hospital in New Castle and let us know you’re coming. No appointment is necessary. Learn more about your emergency visit. 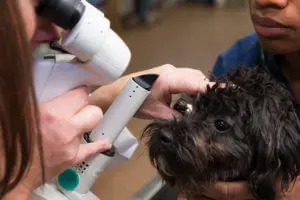 Specialty Care: Specialists at BluePearl veterinary hospitals work directly with your primary care vet to understand your pet’s condition and develop the appropriate treatment plan. Visits to our specialists are usually by referral from your primary care vet and by appointment. Learn more about veterinary specialists. Our well-equipped New Castle hospital has an ICU, a CT scanner, a state-of-the-art rehabilitation center, a designated cat ward, 10 exam rooms and three surgical suites.